Today I traveled to Detroit, Michigan, by the way of The Detroit News dated March 18, 1965. There I found “Russian Takes First Space Walk From Orbiting Ship”. This was the very first time that anyone had ever taken a walk in space, going sixteen-feet from the capsule. 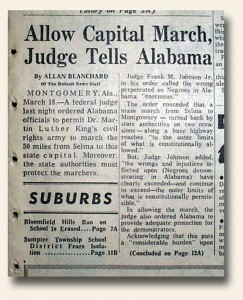 Also on the front page was the reporting of “Allow Capital March, Judge Tells Alabama.” “A federal judge last night ordered Alabama officials to permit Dr. Martin Luther King’s civil rights army to march the 50 miles from Selma to this state capital (Montgomery). Moreover, the state authorities must protect the marchers…”. 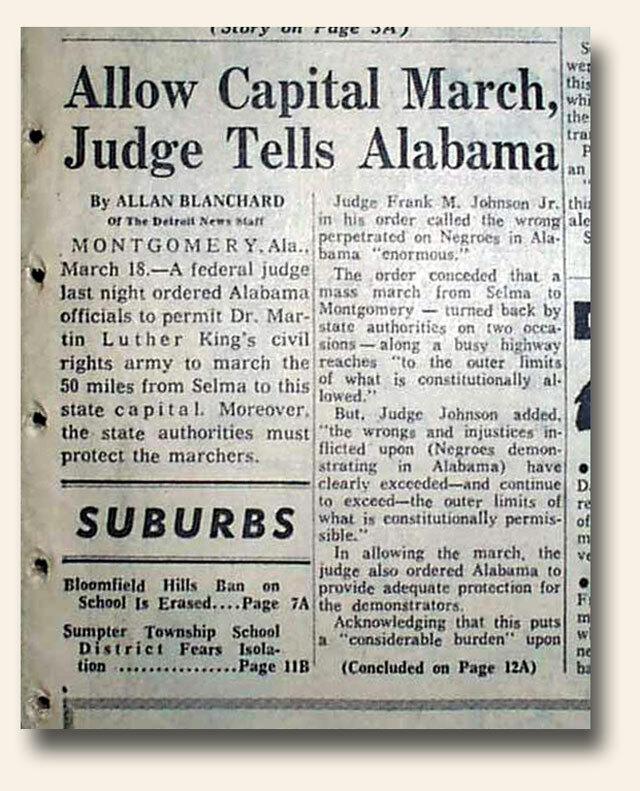 This was the granting of permission for the infamous Selma march which took five days to complete with thousands of people participating. As China, Russia, and the U.S. (among others) begin to enter a new space race – a manned mission to the Red Planet, we are reminded of the early days of flight when dreams were high and understanding was… perhaps a bit lacking. While early film fueled the excitement, it wasn’t until knowledge of Robert Goddard’s work became widespread that the thought of space travel made the leap from dream to real possibility. These dreams took a hit on January 13, 1920 when the NY Times printed an editorial (unsigned) which scoffed at the proposal. However, on February 4, 1920, the President of the Aviator’s Club of Pennsylvania, Captain Claude R. Collins, restored the public’s hopes of space travel when he volunteered to be a passenger on a Mars bound rocket, if ever developed. Ironically, this “offer” was published on the front page of the of the February 5, 1920 NY Times (see image), alongside of the announcement from the Smithsonian Institution stating Goddard had invented and tested a rocket that might have the potential to reach the moon. This battle between nay-sayers and dreamers continues to this day. I wonder how we will be looked upon 100 years from now?